Handmade eye-catchers of precious peacock and ostrich feathers, shimmering coque feathers and more! Professional clip attachment for strong hold in your hair! Large fascinators and headpieces - make a statement with these unique eye-catchers in your hairdo! 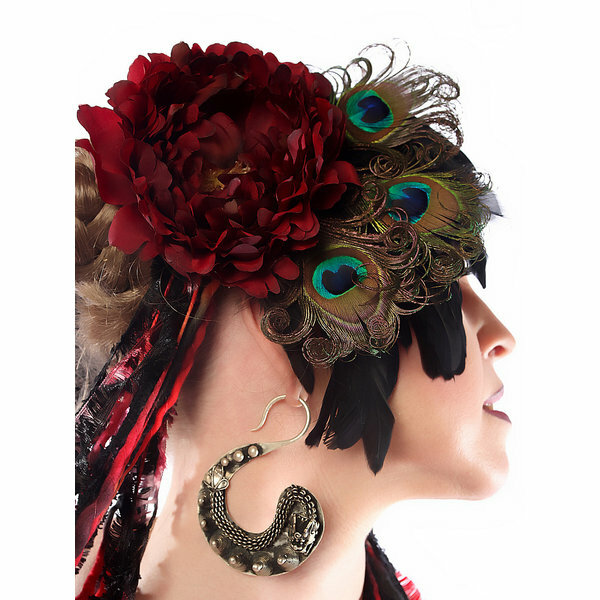 Feather headpieces and fascinators turn your hairdo into a whole different style within a couple of seconds. Here you find all larger pieces of hair jewelry, from 15 cm/ 5.9 inches diameter. Most models come with a carefully arranged bouquet of feathers - a vairety of coque feathers in different colors, coque feathers in a mix with pheasant or even peacock feathers. Naturally all our headpieces and fascinators are handmade to order just like all hair jewelry by Magic Tribal Hair. Pick from fascinators and headpieces with fluffy ostrich feathers and nostalgic peacock feathers; our peacock headpieces with hand curled feathers are especially unique! 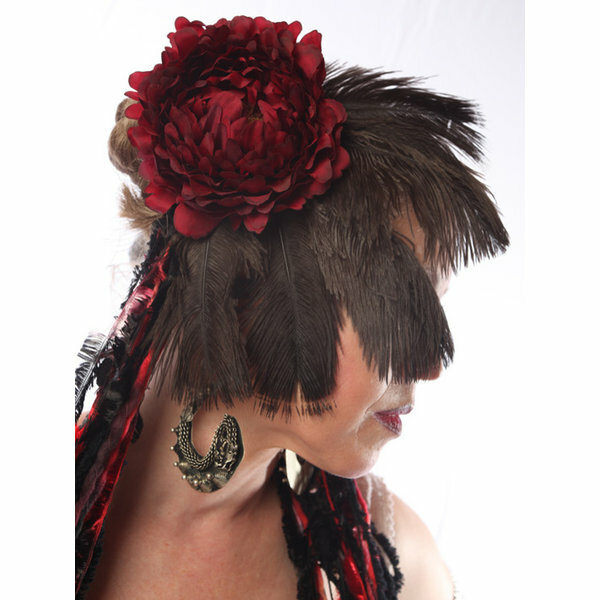 Peacock feathers look precious and noble with any occasion from wedding to Goth or steampunk event and even with all fashion styles from modern to classic elegant to boho. Our colorful fascinators of coque feathers and ostrich plumes are perfect for any boho styling, black feathers and other dark colors match Gothic outfits, brownes and earthy shades go with steampunk look... Our fantasy headpieces are gorgeous for costuming like Larp, Cosplay or Halloween, too and naturally perfect for tribal fusion belly dance and burleque performances! If you think these large fascinators and headpieces are a bit too pompous, feel free to check the smaller feather hair clips! Our smaller peacock feather fascinators are our most popular hair jewelry for weddings and other formal occasions! 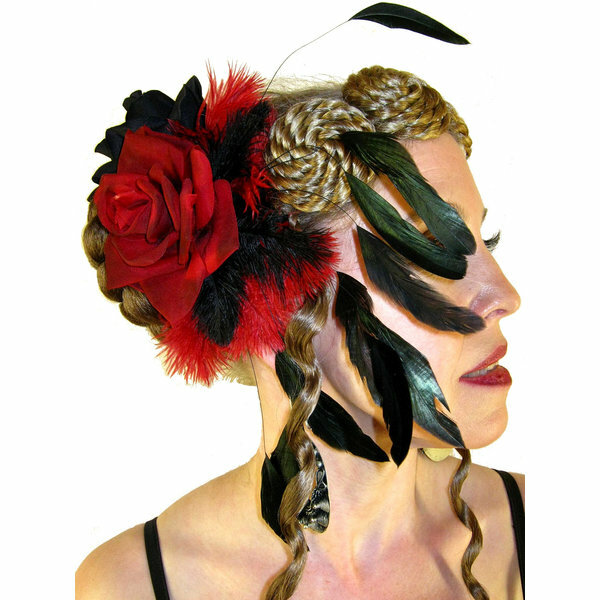 Click here for smaller fascinators and hair clips of peacock feathers! 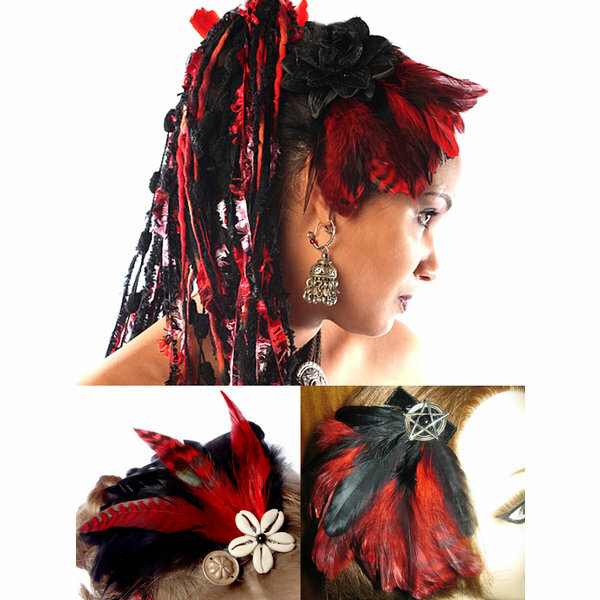 Click here for hair clips and smaller fascinators of ostrich feathers! Feather Extensions and Entire Fantasy Hair Pieces with Gorgeous Feathers! Would you like to get real peacock hair with feathers? 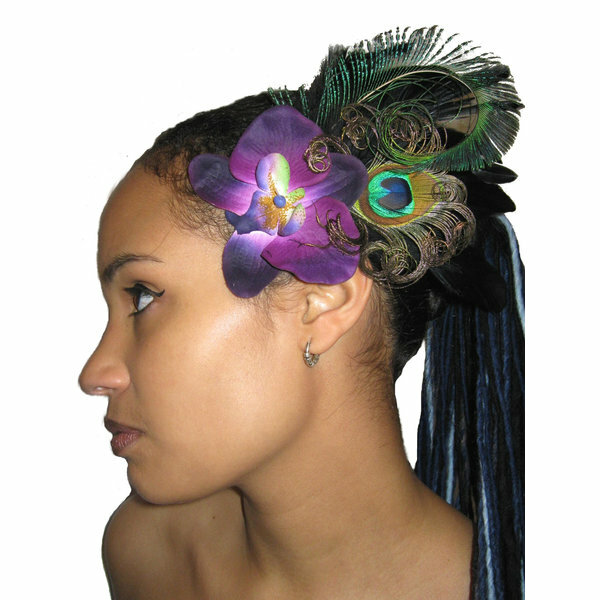 Then have a look at our unique peacock feather extensions here in our shop! Or would you rather have a large fantasy style hair piece with peacock feather decoration? Then have a look at our magician peacock hair falls here! Or have you fallen in love with our fluffy ostrich hair accessories? Then don't miss these real ostrich feather hair extensions among our fantasy clip hair pieces here! And make sure to check our fantasy style magician hair falls with ostrich feathers here, too!